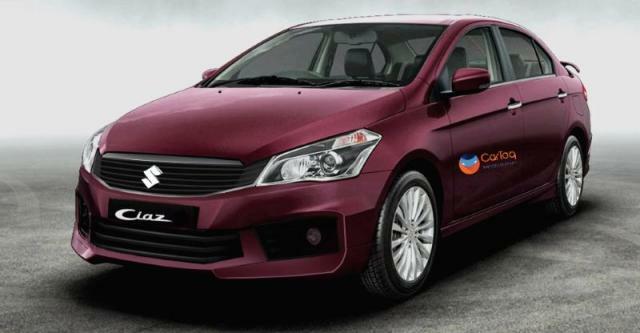 Maruti Suzuki India Ltd (MSIL) has been busy testing the Ciaz facelift on public roads. There are good chances that the new 2018 Maruti Ciaz facelift would launch soon after its public debut at the fast-approaching Auto Expo 2018. Seen below here is a speculative model suggesting what the new model could look like when it makes its debut next month. The new Maruti Ciaz facelift will sport subtle styling changes for both its exterior and interior. It will likely come with a slimmer radiator grille and the bumper will get chunkier. The foglamps will be new, too. In side profile, the updated car will come with new design alloy wheels. The interior will likely get an upholstery change and minor styling changes. The Ciaz might even get some new features Specifications are likely to remain untouched, which means the car will continue to draw power from a 1.4-litre VVT petrol and a 1.3-litre DDiS 200 diesel engine. In future, Maruti plans to replace the Fiat-sourced motor with an ingeniously developed 1.5-litre diesel engine. The new model Maruti Ciaz launch will take place in the second quarter of this year. Before that the car will make its India debut at the next Delhi Auto Expo. The Ciaz facelift will continue to be on sale only at the Nexa dealerships. Prices should remain more or less the same. The top end variants could get more expensive thanks to the addition of new features. The Ciaz, since it is now being sold through the Nexa sales channel, adopts a new variant nomenclature. There are five trims on offer – Sigma, Zeta, Delta, Alpha and S. The ‘S’ trim is nothing but the ‘RS’ trim. Presumably, Maruti wants to reserve the ‘RS’ badge for higher performance variants like the Baleno RS only. Hence, the switch to S from RS. We feel that the upcoming 1.6-litre petrol engine might launch in the resurrected RS trim. The India-spec Ciaz facelift will get the same engines as the current car. This means that the K14 1.4-litre Petrol and the Fiat-sourced 1.3-litre DDIS turbocharged Diesel engines will continue to impress us with their smooth performance and a high mileage. India might also get a new 1.6-litre petrol engine that powers the China-spec model. This new engine will enable the Ciaz to fend off the heat from the powerful new Hyundai Verna. This Petrol engine outputs a max. power of 121 BHP and a peak torque of 158 Nm. Lastly, the car might also get the new 1.5-litre Diesel engine instead of the 1.3-litre Fiat-sourced motor. However these new engines will debut much after the new facelift is launched in India. Aided by the excellent SHVS, the 1.3 L Diesel engine makes the Ciaz one of the most fuel efficient cars on sale in India. It offers an ARAI-tested average mileage of 28.09 KMPL. Even the petrol engine offers an average fuel mileage of around 20 KMPL. The new Maruti Ciaz facelift will get a rather comprehensively updated front fascia.It will likely come with a slimmer radiator grille and the bumper will get chunkier. The foglamps will be new, too. In side profile, the updated car will come with new design alloy wheels. At the rear-end, the car will probably get an updated bumper and new taillamps. On the inside, the new car will remain largely unchanged. It is expected to offer the same black-beige colour theme and the same design for the dashboard and the steering wheel. However, the faux wood insert might be replaced with a gloss black trim. The new features include six airbags and electric sunroof. Other features that the car comes with include ABS with EBD, keyless entry with push button start, and rear AC vents. The facelift will also get an updated Smartplay infotainment unit that will support both Anroid Auto and Apple CarPlay. For China, this unit comes with Baidu CarLife support. The features list also includes rear parking sensors with a camera. The Ciaz continues to offer a spacious cabin that can seat five passengers in reasonable comfort. The legroom, both at the front and the back, is almost phenomenal for a car of this class. Stay tuned for more on the new Maruti Ciaz Facelift launch date, price, specs, mileage, and features.